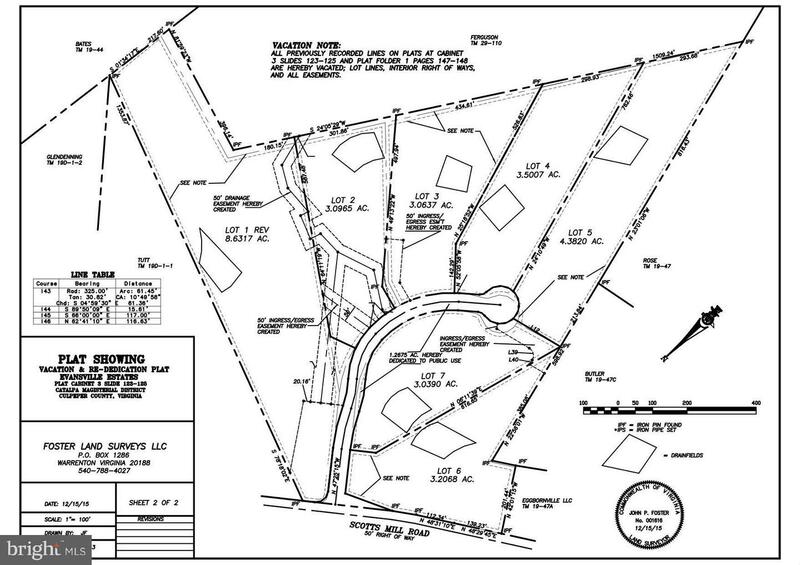 Lot 1 of 8 Lot Subdivision of Wooded Lots- 4 Bedroom alternative perc approved. Elevated Home Sites, beautiful rock formations, creeks & cul-de-sac location. Rural county division w/covenants. Lot is part of Tax ID#19-J-1- -1. Taxes not yet assessed.Lots are finished, ready for new construction. COMCAST is available. Direction: CULPEPER:522 WEST TO R ON RT629 TO NEW SUBDIVISION ON RIGHT W/SIGN. WARRENTON:RT29S, FIRST EXIT TO DOWNTOWN CULPEPER, R ON RT522W, APPROX 5 MILES TO R ON RT629 (SCOTTS MILL) TO NEW SUBDIVISION ON RIGHT W/SIGN. 1 HOLLOW OAK COURT , Culpeper VA 22701 is a Land, with 0 bedrooms which is for sale, it has 152,721 sqft, 152,721 sized lot, and 0 parking. A comparable Land, has 0 bedrooms and 0 baths, it was built in and is located at 7 HOLLOW OAK COURT CULPEPER VA 22701 and for sale by its owner at $ 84,000. This home is located in the city of CULPEPER , in zip code 22701, this CULPEPER County Land, it is in the EVANSVILLE ESTATES Subdivision, and HITT are nearby neighborhoods.